Multiclassing done right can be one of the coolest things in an RPG. We’re none of us typical, after all, so it can feel suffocating to be typified – especially in a genre that, more than any other, aspires to self-expression. Hybrid classes let us mix those types to achieve a comfier fit, but not too many RPGs offer them. 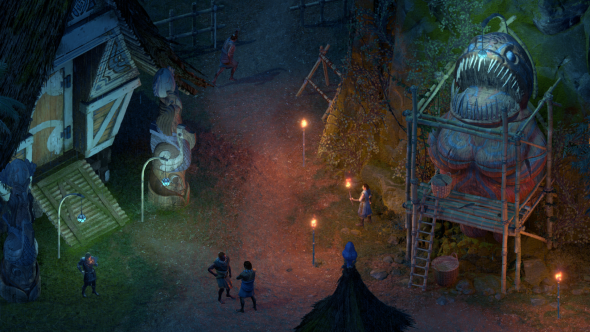 Pillars of Eternity II: Deadfire, will do so, and in the developers’ latest backer update, we learn how. Here’s everything we know about Pillars of Eternity 2: Deadfire. The multiclassing system has changed during development. In the original concept, you picked between either class’s powers at every level. This could result in “bad gaps in the character’s progression,” game director Josh Sawyer says, leaving your character underpowered. That’s no fun for anyone. Now, you’ll receive a power from each class every time you advance to a new power level. Multiclass characters access new power levels more slowly than single-class ones, and cannot access any class’s highest-level abilities, but they will wind up with more powers overall. Jack of two trades, but master of neither, to adapt a phrase. There then follows some footage of various multiclasses using their abilities – we see a Battlemage, for instance, draw an enemy within striking distance, and a Beastmaster turn into a bear so he can fight alongside his bear pet. With eleven classes, there are 55 multiclass combinations, each of which has a cool hybrid name like Hierophant (Cipher/Wizard), Wildrhymer (Ranger/Chanter), and Shadowdancer (Monk/Rogue). When you then consider that each base class has three or more subclasses – and you get to choose subclass specialties when multiclassing – the number of combinations is astronomical. Even a Fallout Pipboy can’t help Sawyer work it out. For all the granular details – which, as we all know, are fascinating – you can read more from Sawyer himself on the Obsidian blog. He discusses each of the subclasses too, so you can imagine your fantasy alter-ego in almost unprecedented detail. Personally, I’ll be rolling an Arcane Knight made out of a Darcozzi Paladini Paladin and an Illusionist Wizard. What a joy of a sentence that is.